This morning when I signed on to Facebook, Eating Well magazine had posted a new recipe – Roasted Asparagus with Pine Nuts. I sent the link off to my mom because I know she likes asparagus. Then I was at Kroger a few hours later and they had asparagus on sale for $1.77/lb. On a whim, I put a bunch in my cart. Now, I’ve never been a big fan of asparagus. As a matter of fact, I think today was the first time I’ve ever bought it myself. I’m pretty sure I’ve only ever had it at someone else’s house. 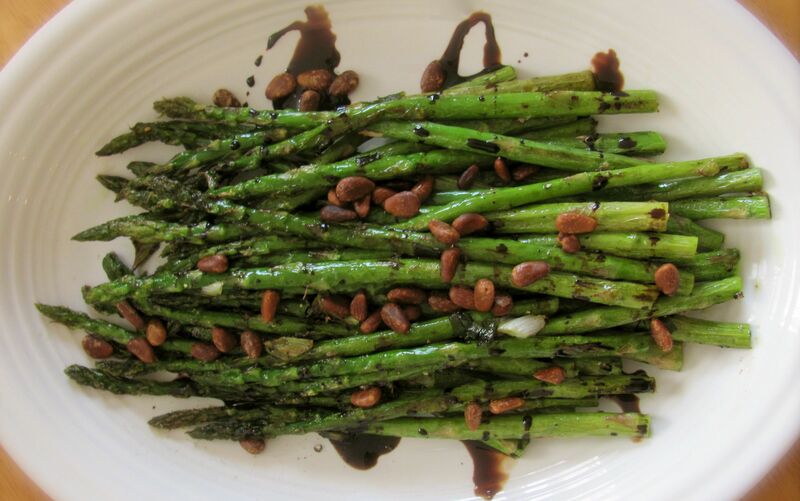 But this recipe intrigued me because it has pine nuts and balsamic vinegar, two of my favorites. It was unbelievably easy and fantastic! I served it alongside penne pasta with tomato sauce, but it would make a beautiful side dish for Easter dinner. The recipe is available here. The only thing I would change is the time for toasting the pine nuts. The recipe says 7 to 10 minutes. I checked mine at 7 minutes and they were overdone (see picture; I used them anyway). I’d check after 5 minutes next time. Want to hear the funniest part? After dinner, I got an email from my mom that said, “Made this for myself tonight with some leftover mushroom pasta. It was really yummy! Not a pine nut in the house, so I used some toasted almonds. Delish!” How cool is that? If you aren't a member of my family and you've been reading this blog, you have probably figured out that I love to cook and experiment in the kitchen. This morning, I started the tea kettle and began preparing my usual bowl of quick cook oats and raisins. But I had a bag of dried cranberries sitting on counter (for the Total Crunch Salad, which I'm making later today) and decided to put some in my oatmeal instead of the raisins. But, maple syrup just didn't sound right with cranberries so I got to thinking and here's what I came up with. It's simple to make and oh, man, is it good! 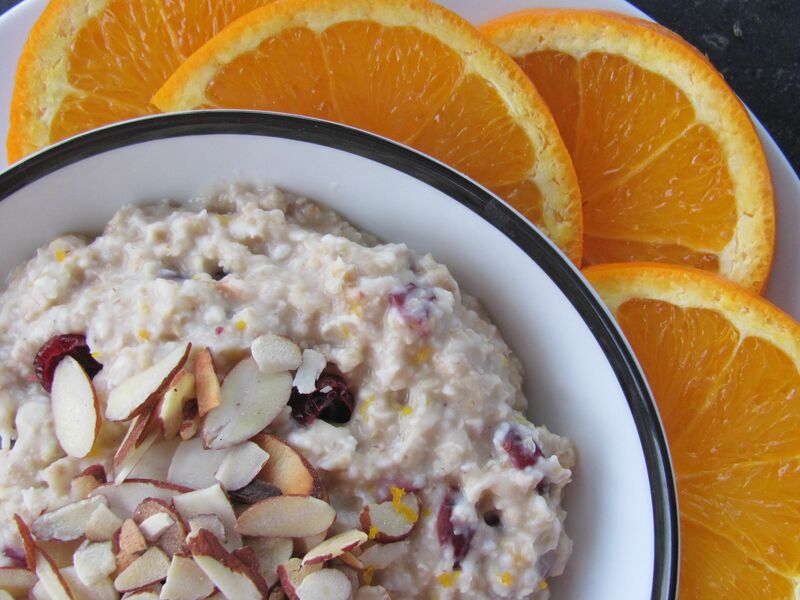 Put oats, dried cranberries and Truvia in your serving bowl. Add about 3/4 cup boiling water and stir. 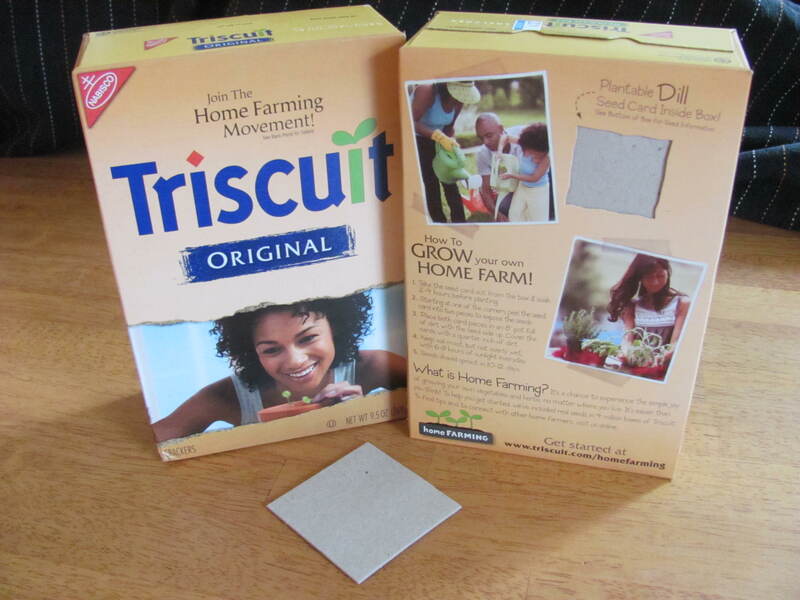 Quickly cover with a small plate or pan lid and let sit 2 minutes. Uncover and stir in orange zest. Top with toasted almonds. Slice the rest of the orange and enjoy! Be sure to check back tomorrow — I'm trying two new recipes today. One is a vegan cornbread to go with the vegan chili I'm making for dinner. I'm also going to try another cupcake recipe from Vegan Cupcakes Take Over the World. Today, while shopping at Kroger, I decided to check my blood pressure on the big BP machine they have in the pharmacy. To get an accurate reading, you should always do a series of at least 3 readings in a row and then go with the average of those to determine your BP. (So don't let your doctor get away with one reading, if he tells you it's high). Anyway, all 3 of my readings were very similar and the average was 146/98. THAT'S AWESOME! I haven't been below the 150/100 mark in a very long time. It may be that this machine reads differently than my home machine. Not sure. Either way, I'm pretty excited. Some more exciting news…I had blood work done last week which included a cholesterol test. Your total cholesterol should be below 200. Mine is 158! My chiropractor even said, "that vegan diet is doing you some good!" Your triglyceride reading should be less than 150. Mine is 98. Perfect. Your LDL (the "bad" cholesterol) should be less than 100. Mine is 94. Perfect. Your HDL (the "good" cholesterol) should be above 50 for women. Mine is 45. Not bad, but the higher it is, the less likely you are to develop heart disease. So I need to work on getting that higher. Do you know what the best way to increase your good cholesterol is? Exercise. Yippee. 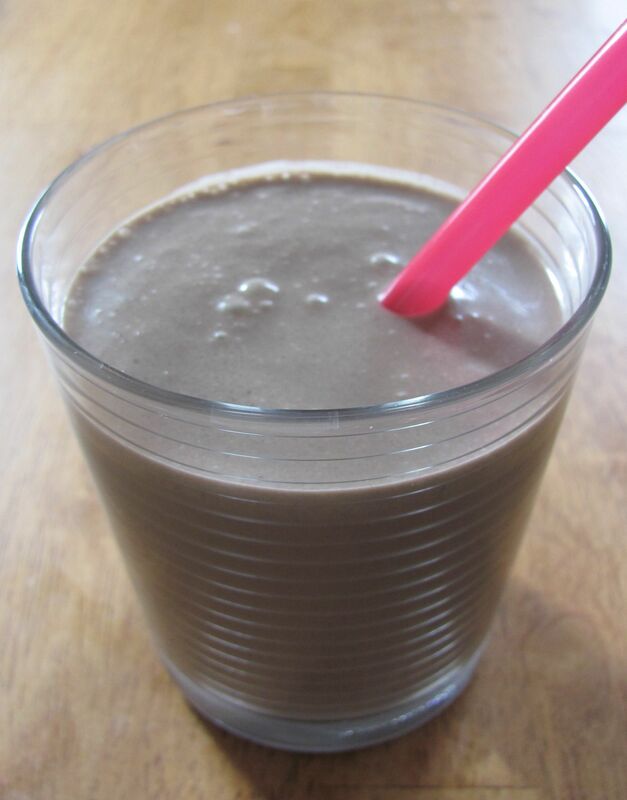 So to celebrate, how about a delicious vegan smoothie? Here's one I made for the kids yesterday. It's not only healthy, it could pass for dessert. All three kids were smiling at the same time! Put all ingredients in blender. 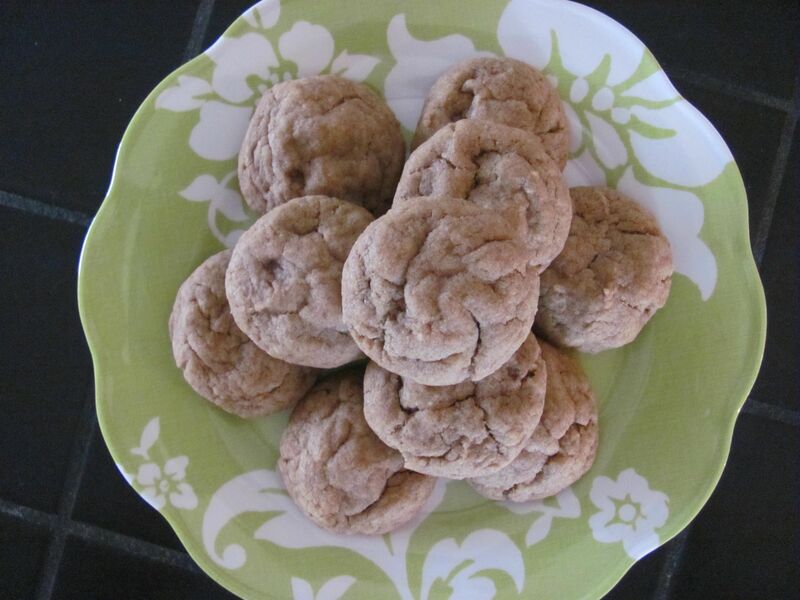 (Start with 1 tablespoon cocoa powder and add more to taste after blending.) Blend until smooth. Taste and adjust flavors as needed. Enjoy! On my way to the chiropractor the other day, I stopped at Monnette’s — a family-run fruit/veg/deli market in Toledo. I needed to pick up fruit for lunches. Their produce is always so beautiful and I felt inspired to cook a big pile of roasted vegetables. I bought zucchini, yellow squash, onions, a beet (which I’ve never cooked before), eggplant, and red peppers. I also bought sweet potatoes, sugar snaps, green beans and a bunch of fruit. Yesterday I chopped up a ton of the vegs, tossed them in olive oil, S&P, and roasted them in the oven. I’m not a big fan of eggplant so I roasted those with some garlic on a separate baking sheet, just in case. I ate a huge plate of the roasted vegs (not eggplant) for lunch. Then I decided to get creative with the eggplant. Have you ever had baba ganoush? It’s a Middle Eastern dip made with eggplant and served with pita bread. It’s not one of my favorites. But it made me think that maybe I could do some other kind of dip with eggplant as the base. After a little experimenting, I succeeded! I’m calling it a paté because it’s pureed vegetables that you spread on bread. The recipe uses tahini, which is basically ground-up sesame seeds. If you aren’t vegan, just use regular mayo instead of the Vegenaise. This is absolutely delicious served warm, spread onto toasted or grilled baguette. I had a whole grain one in my fridge, so I sliced it and just toasted it in the toaster so I could try the dip on it. I’m looking forward to having some at lunch today to see if the flavors developed even more. Preheat oven to 400 degrees. Lightly coat a baking sheet with nonstick cooking spray. In a large bowl, toss together eggplant, garlic, oil and a few good dashes of grill seasoning. Spread evenly on the prepared baking sheet and roast in the oven for 20 minutes or until garlic cloves are tender and eggplant is lightly browned. Allow to cool slightly. Place eggplant, garlic, tahini and cayenne pepper in food processor and puree until smooth. Remove to a bowl and stir in Vegenaise and balsamic vinegar. Blend well. Add salt and pepper, if needed. Lightly fold in parsley. Scoop it into your serving bowl and sprinkle with walnuts. Serve warm with toasted/grilled baguette slices. Enjoy! I love soup. It's such a perfect choice for dinner, especially when homemade. You can control the sodium and fat and you can jam pack it with vegetables. The perfect accompaniment to soup? 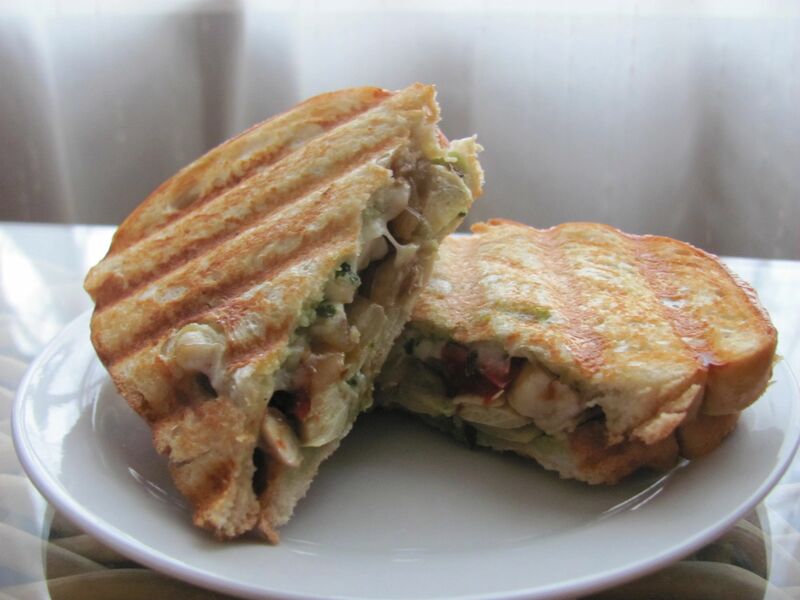 Grilled paninis, without a doubt. I made a fabulous vegan panini the other night for dinner. It's so easy, you don't even need a recipe. First, make some pesto mayonnaise. Scoop a couple spoonfuls of Vegenaise into a small bowl. Stir in a heaping tablespoon of pesto (made without Parmesan). Blend well and set aside. Heat olive oil in a small skillet. Saute a bunch of your favorite veggies — I used sliced mushrooms, zucchini, red peppers, onions and garlic. Season with salt substitute and pepper and a little dried thyme or any other seasonings you like. Assemble your sandwich next. Yes, I should have used a whole wheat bread, but this beautiful loaf of artisinal bread was on sale at Kroger, so I bought it. Slice it nice and thick so it holds up when grilled. Spread two slices of bread with the pesto mayo. On one slice, layer your sauteed veggies. I also added a layer of artichoke hearts (canned, drained, rinsed). Spinach leaves would have been a nice addition. You can add some vegan cheese if you've found a brand that you like. Put the other piece of bread on top and grill. We cooked ours in the George Foreman grill, which presses them perfectly. Enjoy!